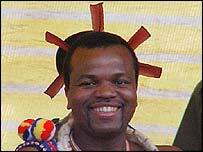 Africa's last absolute monarch, King Mswati III, has chosen a 16-year-old beauty queen as his latest bride-to-be. The Miss Teenage Swaziland finalist appeared at last week's annual reed dance during which 20,000 bare-breasted virgins parade in his honour. The 36-year-old king's behaviour has been criticised in a nation with one of the world's highest HIV/Aids rates. would be satisfied with 11 wives. His father had more than 60 wives. In line with Swazi tradition, a fiancee becomes a wife once she falls pregnant. Plans to build new palaces for each of his wives are also draining the tiny country's resources, with the IMF urging cut-backs as poverty and food shortages hit ordinary Swazis. His 10th wife, Zena Mahlangu, was controversially abducted two years ago when she was 18. Her parents failed to get their daughter returned after taking the king's aides to court for unlawfully detaining her.